That $130 pricetag is off-contract, by the way. Motorola popped up with two big announcements today, the first being an all-new entry-level smartphone. The Moto E is a smartphone for the masses, packing powerful-but-not-high-end features into a device that's only $130 off-contract. The specs: 1.2GHz Qualcomm Snapdragon 200 CPU, 1 GB of RAM, 4 GB of storage, and a Gorilla Glass-covered, 4.3-inch 960x540 display. There's no LTE connectivity (3G only), but there is WiFi, Bluetooth 4.0, and a MicroSD slot for added storage. 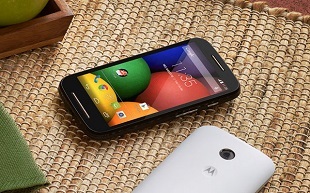 The Moto E, which is running Android 4.4, is primed for emerging markets, but in the states? It seems like the perfect smartphone for the kid in the family. $130 is nothing to sneeze at, but it sure beats replacing an iPhone or Galaxy S4/S5 off-contract. Motorola also rolled out a refresh of the Moto G. The two big adds for the G are LTE connectivity, and a MicroSD slot. The LTE radio should play nice with T-Mobile and AT&T in the U.S. The extras bump the off-contract price up a bit to $219. The rest of the specs (Android 4.4, 1.2GHz Qualcomm Snapdragon 400 quad-core CPU, 1 GB of RAM, 8 GB of storage, 4.5-inch 720p display) are all the same.